Last week I attended the Independent Garden Center Show in Chicago. This tradeshow is for garden center owners to get a preview of the plants and products available for them to sell next year. There were also presentations and workshops for garden center people to network and share ideas. For a humble home gardener and plant geek like myself, it was like being a kid in a candy store. Media attendees were encouraged to tweet their experiences from the show floor. I love tweeting from my chair at home, but ended up getting so engrossed talking with friends and vendors, and looking at a huge variety of plants, seeds, and gardening gadgets and goo-gaws, that I completely forgot to tweet. There was so much to see! 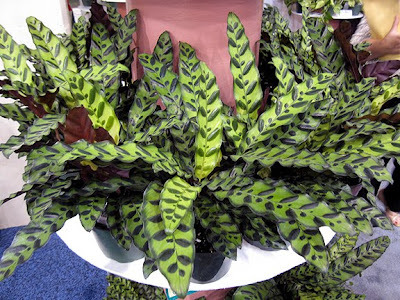 I loved the texture (much softer than you'd think) and color of this houseplant, Calathea lancifolia or rattlesnake plant. 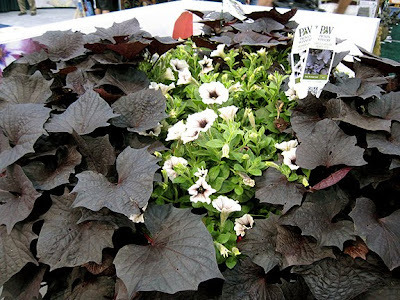 The undersides of the leaves are purple, and the plant grows to 30". If I had more space indoors and weren't a confirmed houseplant hata, I'd actually consider getting this! Even though I love squirrels (my "problem children" are groundhogs and raccoons), and do not want to shoo them from my garden, this display for Cole's Flaming Squirrel Seed Sauce tickled me no end. The bloodshot eyes, the steam coming out of the ears ... classic. I loved these retro-looking pieces from Garden Iron and More. 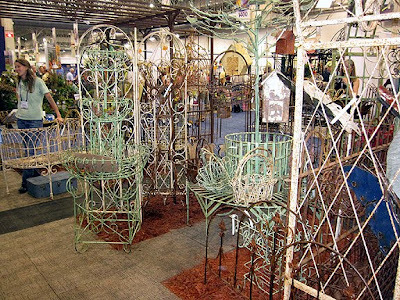 They had trellises, gates, seats, plant hangers, and more, all very reasonably priced. I love rust in the garden. 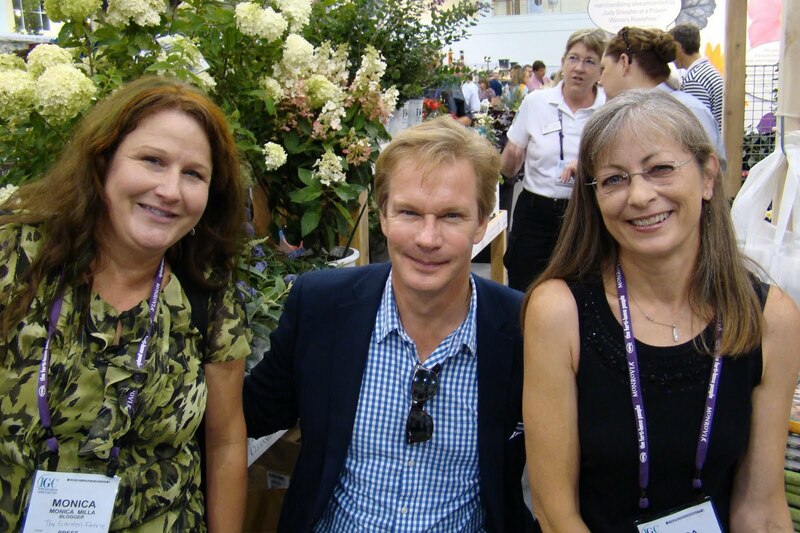 Gardening personality P. Allen Smith was a keynote speaker at the conference. Despite his demanding schedule, he made himself available to bloggers and was very approachable and down to earth. Here Linda and I pose with Allen just before he signs complimentary copies of books for us. I picked P. Allen Smith's Container Gardens: 60 Container Recipes to Accent Your Garden, from which I'm sure to get a few ideas to add to the container gardening class I teach at WCC. These are the new seed varieties for 2012 from Renee's Garden. I admit I had a bit of a fan-girl moment meeting her in person. I've been buying her company's seeds for a long time, and liked her ever since I saw her years ago on a segment on Gardening by the Yard. A super knowledgeable gardener and sower, but completely down to earth and real. I regret not having my wits about me to have my photo taken with her! Come back tomorrow for a post on my tour of Ball Horticultural Co.
What fun. I know what you mean about meeting celebrities or other people you admire. It is nerve racking. That house plant is a keeper. Iron and more would have all my money in no time flat. What fun you had! It looks like a perfect place for gardeners. What a fun weekend outing, Monica! 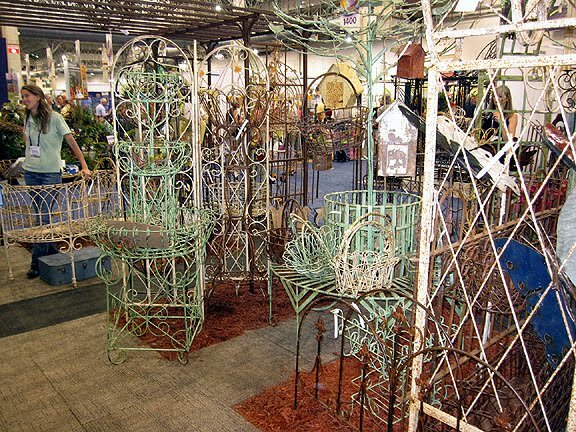 I love all that ironwork, too; I'm sure I could find some places in my garden for several pieces. How exciting to meet P. Allen Smith and Renee; I think I would have been a little star-struck as well. Looking at your header photo, your home garden is full of color right now. It's so nice when people who have a very public persona are down to earth. Love the pic of you and Linda with PAS. I remember the segment with Renee on GBTY also! Loved that show. Dear James, this is Siena. I was shocked to hear about sweet Fiona. This is terrible, we are very sad for your loss. Both Chilli and I are offering comforting purrs to you and your human. Wow, das muss Spass gemacht haben! Ich glaube, diese tollen Gestelle von Garden Iron hätten mich arg in Verführung gebracht. Ich liebe solche Teile in meinem Garten! Das Eichhörnchen hingegen ist mir ein bisschen zu kitschig, da mag ich die richtigen viel lieber :o). Wünsche Dir ein genussvolles Wochenende. 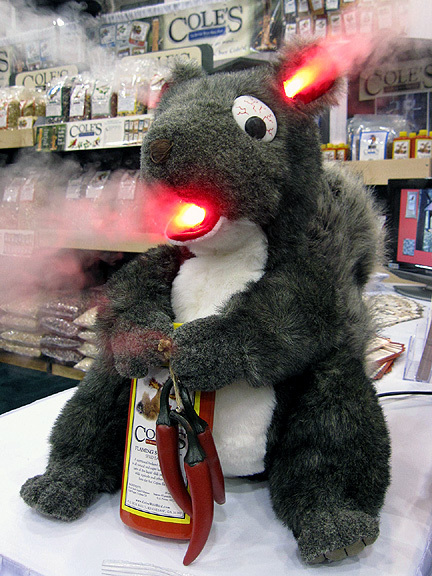 Lol..Thanks for sharing the Squirrel Free products. Squirrels and stray cats are a big problem for me, I visited the site and learned that this product is very versatile. 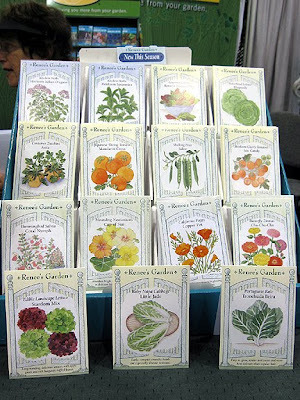 Looks like you had a fantastic time, good for you..
Im so jealous you met Renee of Renee's garden seed. I love her seeds! Looks like you had so much fun! Yeah, we forgot to get a photo with Renee! What a whirlwind time that was - lots of fun, great seeing you again Monica!